In doggie land, spinning can mean a number of things. If your pooch has a habit of spinning around in circles, don't ignore it and assume that he's "just being a dog." Although circling behaviors can indeed be totally innocuous, they can also occasionally be a sign of medical ailments in canines. Spinning can point to emotional turmoil, too. If severe stress causes you to bite your nails down to the quick, then you're familiar with the concept of compulsion. A dog who obsessively spins around in circles may be dealing with intense frustration that is leading to repetitive actions. If your dog spins around in circles and you can't figure out why, look deeper into his life. Maybe he doesn't get enough attention from you and is home alone all day. Maybe he's upset that his closest canine companion is no longer in the picture. Investigate what may be troubling your dog and get on the path to fixing it, whether it involves the help of a veterinarian or a little extra TLC and attention on your part. Circling isn't the only way that canine compulsions manifest themselves. Other common compulsive actions include immoderate barking, chasing shadows and "snapping" flies. When a doggie spins around in circles before bedtime, he may be behaving in a way that is natural to him -- a vestige of his wild origins. Dogs in the wild often dig out their own resting spots. Once they're satisfied with their work, they may examine it several times over by walking around it in circles. 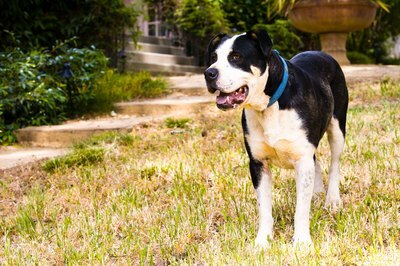 If your pooch circles his bedding site before retiring for a nap or for the night, he's essentially just checking his digging work and making sure that he has a cozy and safe place to sleep -- canine style. Dogs also often circle around as a way of driving out any pesky bugs that may be lingering in their sleeping spots. If a dog is in the midst of a perilous high-anxiety situation, his natural response may be to circle his immediate area obsessively. Perhaps the poor thing is afraid that another larger dog is on the verge of a physical attack -- and simply doesn't know how to handle his predicament. When a dog is spinning around in circles while smelling the ground, the answer is often a pretty simple one -- the pooch has to go to the restroom and needs to go outside -- pronto. Spinning also frequently points to health issues in canines. If your pet is on the elderly side, circling can signify problems with his cognition, whether memory, vision or hearing. It can also be a symptom of various neurological medical conditions, including brain tumors. The sooner you take your dog to the veterinarian and figure out what exactly is causing the circling, the quicker you can take action. Why Do Puppies Chase Their Tails? What Are the Causes of Dogs Running in Circles?